© 2002, © 2018 by Paul Freeman. Revised 9/29/18. 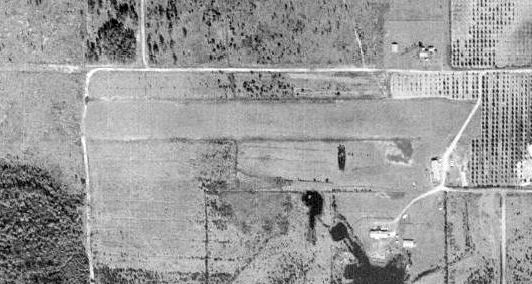 Longcoy Airport, as depicted on a 5/1/52 USGS aerial photo. 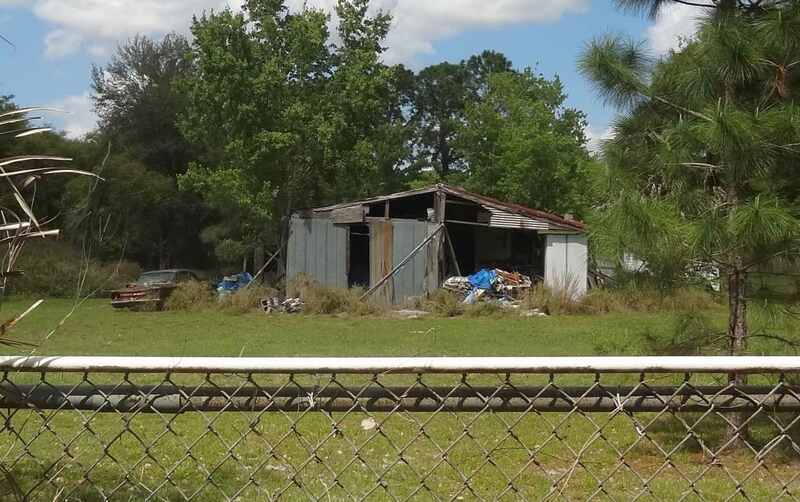 The date of construction of this small general aviation airport on the west side of Orlando has not been determined. 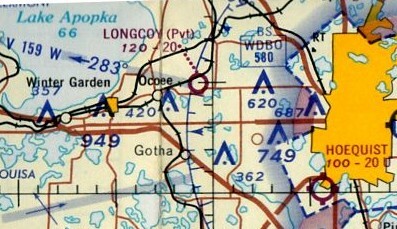 Longcoy Airport was not yet depicted on Orlando Sectional Charts from 1935-52. 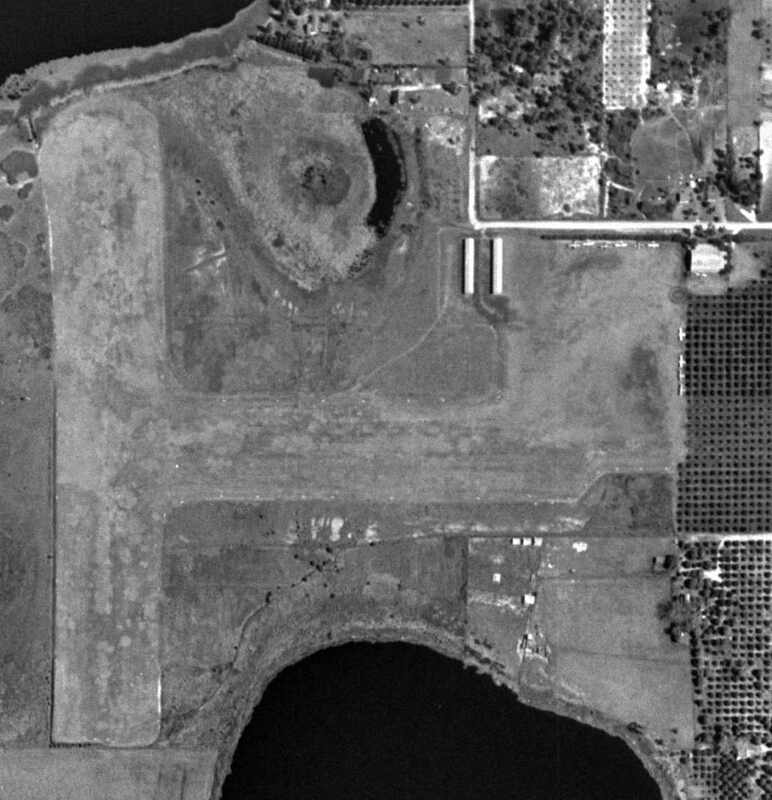 The earliest depiction which has been located of Longcoy Airport was on a 5/1/52 USGS aerial photo. It depicted Longcoy as having 2 unpaved runways in an X-shape, with a few small buildings on the east side. 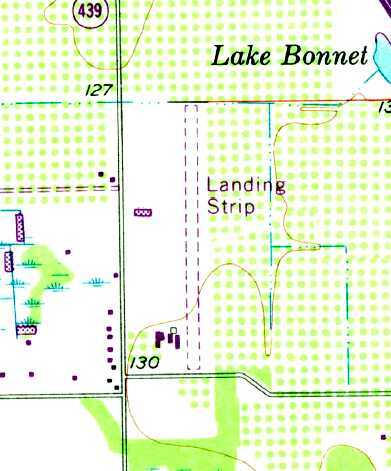 The 1956 USGS topo map depicted Longcoy Airport as 2 runways in an X-shape, labeled simply as “Landing Field”, with 3 small buildings on the east side. was on the November 1965 Jacksonville Sectional Chart. It depicted Longcoy as a private airfield having a 2,000' unpaved runway. 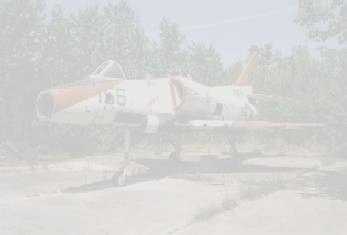 which depicted 4 light single-engine aircraft parked on the east side. 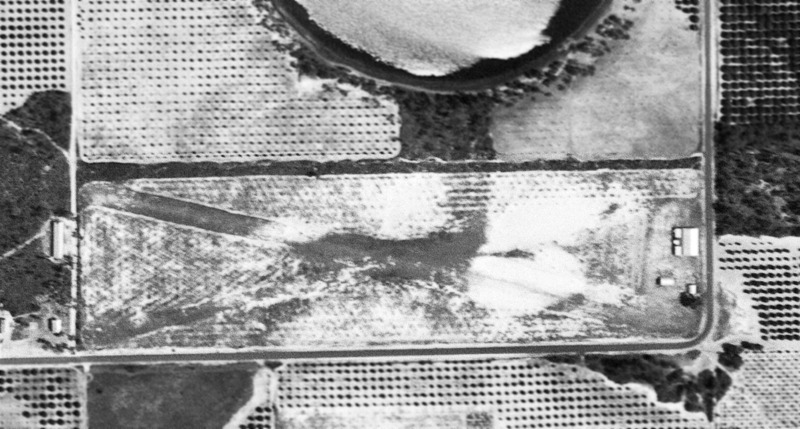 An 11/26/77 USGS aerial photo It depicted Longcoy Airport as having 2 unpaved runways in an X-shape, with a small building on the east side. 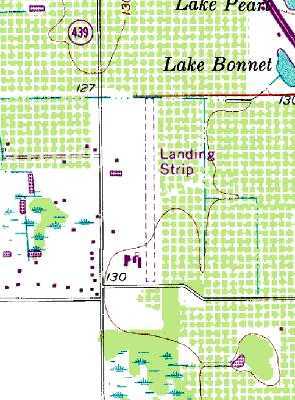 The 1984 USGS topo map continued to depict Longcoy Airport as 2 runways in an X-shape, labeled simply as “Landing Field”, with a few small buildings on the east side. which depicted it as a private airfield having a 2,000' unpaved runway. 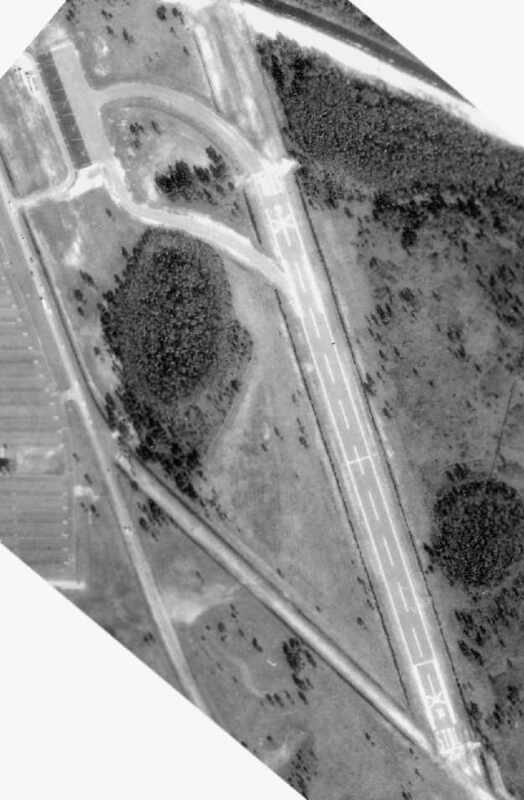 as a 1990 aerial photo showed the runways as deteriorated, and no aircraft on the field. Longcoy Airport was no longer depicted on the 1994 Jacksonville Sectional Chart (courtesy of Ron Plante). 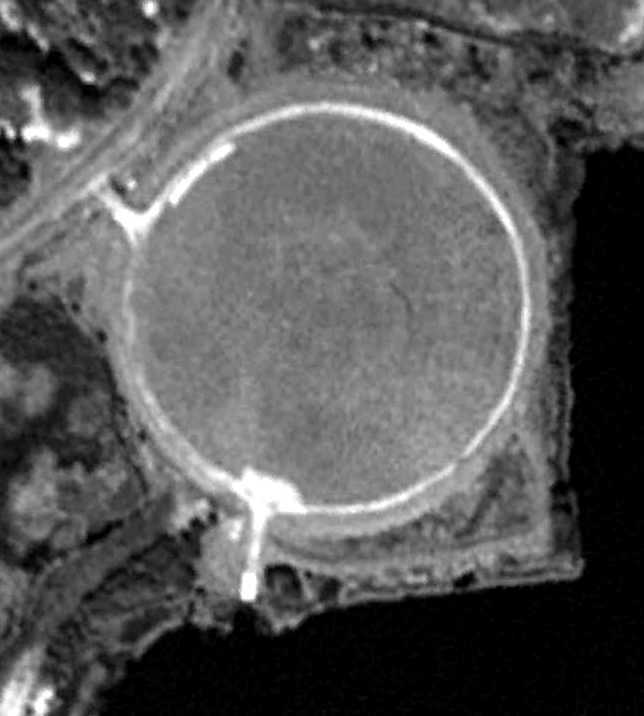 A 1999 aerial view showed the hangar remained standing on the east side of the Longcoy Airport site. and the hangar has been removed. 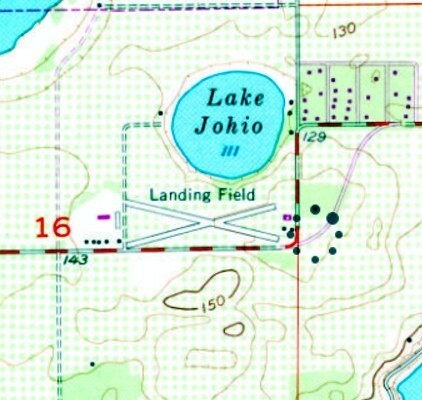 The site of Longcoy Airport is located northeast of the intersection of Lake Johio Road & Silver Star Road. Thanks to Gary English for pointing out this airifeld. A 1966 artist's conception of the never-built Epcot Airport of Tomorrow. included an “Airport of Tomorrow” located on the southern portion of Epcot. and a General Aviation complex on the north side with 3 shorter parallel runways. as none of these runways were oriented in the direction of the prevailing wind in the local area. From the 1966 artist's conception, the location of the Epcot Airport of Tomorrow is shown relative to the rest of the planned Epcot complex. The airport was planned to be located on the south side of Interstate 4. Walt Disney filmed a promotional film about his planned Epcot development in 1966 only 2 months before he passed away. A still from this film shows a revised version of the planned Epcot Airport of Tomorrow. and was smaller & completely different in design, with 3 runways. A 6/23/15 photo by Paul Freeman of the plans for the Epcot Airport of Tomorrow, which remains on display in DisneyWorld's Hollywood Studios theme park. 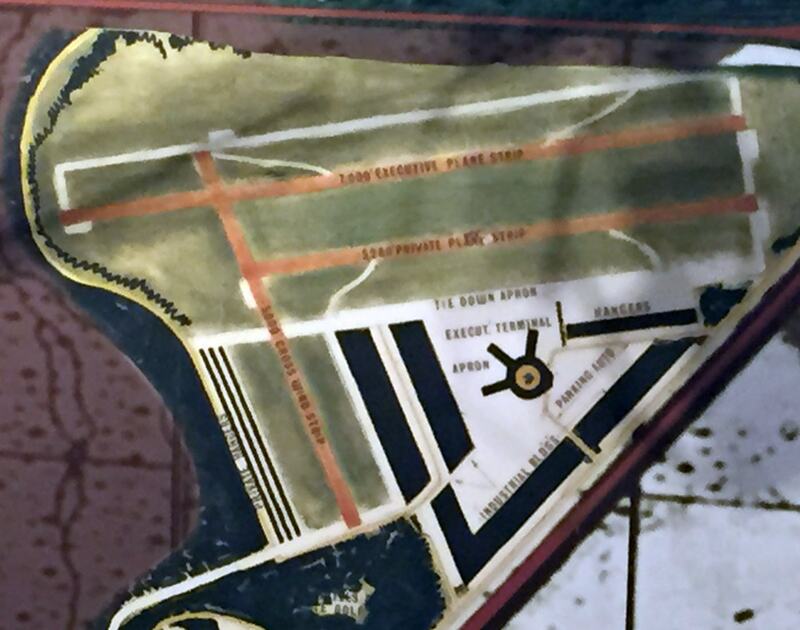 This descoped version of the planned airport included 3 runways, with the longest being the 7,000' northeast/southwest “Executive plane strip”. An apron, executive terminal, and hangars were located on the south side. 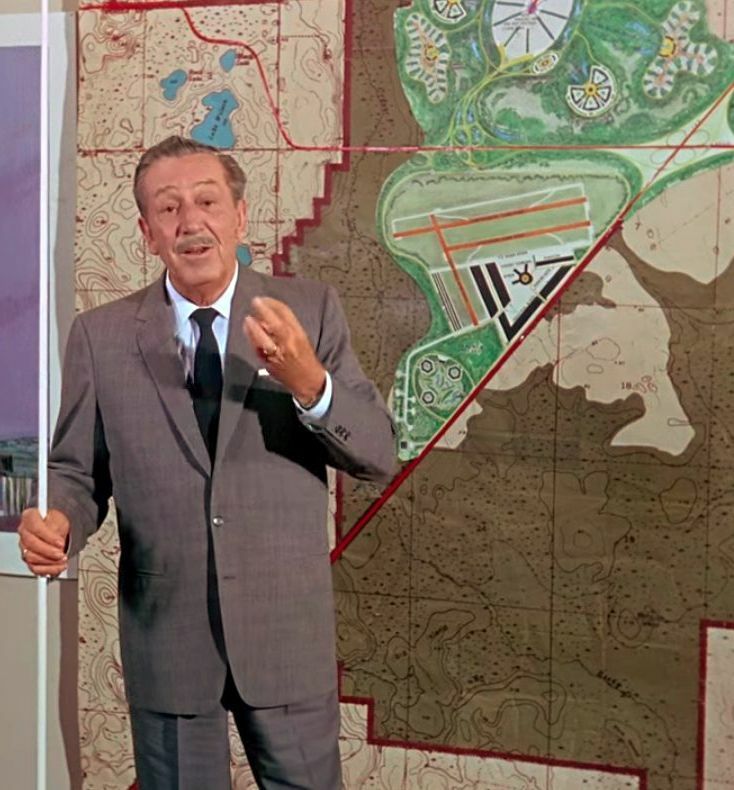 After Walt Disney's passing in 1966, the Disney company shelved his elaborate plans for Epcot. and no longer included an airport. while Disney's Celebration community occupies the planned airport site on the south side of Interstate 4. 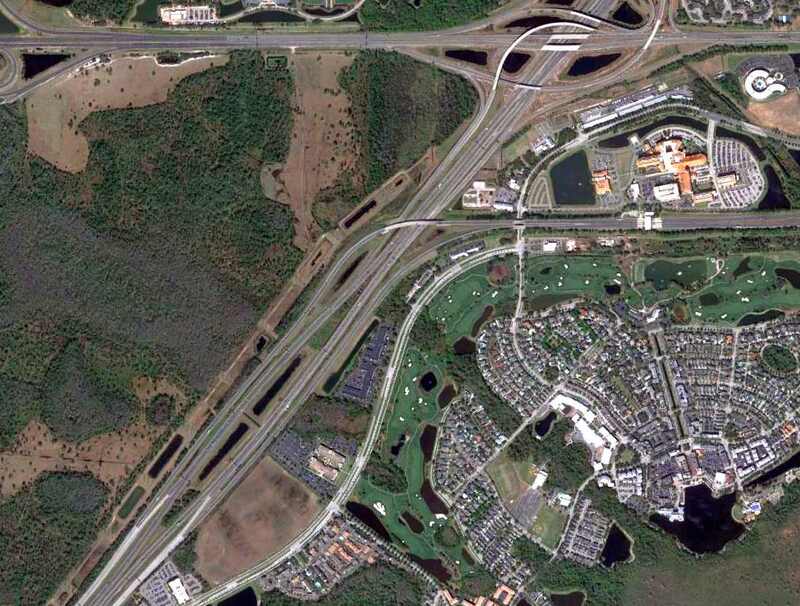 The planned site of Epcot Airport of Tomorrow is located south of the intersection of Interstate 4 & Route 530. 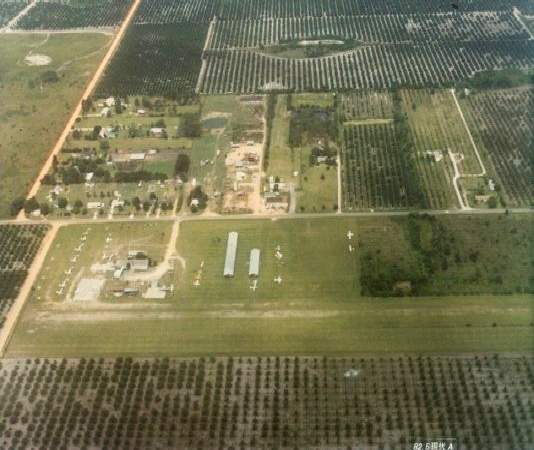 A circa 1960-62 aerial view of Air-Lando Airpark (courtesy of Daniel Lewis). Stan Bronson reported, “My dad was Dave Bronson & he & a couple of his WWII buddies built Air-Lando [Airpark] in 1959. We had a little over 300 acres with the airport in the middle of the property. We had a hangar with an office & lounge. The location of the strip & our house was just northwest of the Beunavista Palace. My job as a 12 & 13 year old was to gas planes & to mow the strip. My dad taught me how to fly by the time I was 10. I remember helping Dad seed the strip with Bahia grass & it was my job on Saturdays to mow the strip with an old Case tractor at the ripe old age of 12.
which depicted a single unpaved east/west runway. Stan Bronson observed of the photo, “The grass has not grown yet to the edges. Stan Bronson recalled, “The hangar was built in 1962. Right after the hangar was built my dad cleared the woods to the east of the house. 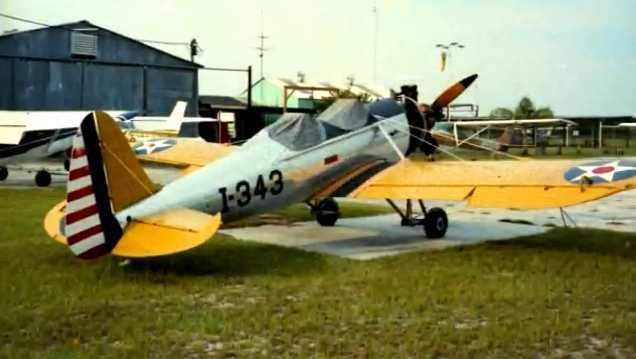 which was the converted P-51 sport version made in Sarasota. We were the very first sale to Disney on 2/3/63. About a week later a cousin of mine, Irlo Bronson, sold the major piece of the property, which was 27,000 acres. which ironically was 2 years after the airport had mostly likely ceased to exist after the property had been sold to Disney. 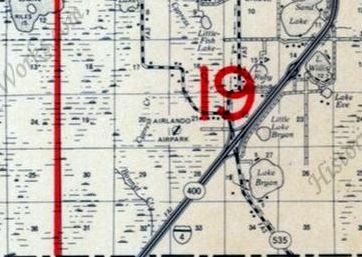 Air Lando Airpark was no longer depicted on the 1965 USGS topo map nor on the 1967 Orlando Sectional Chart. 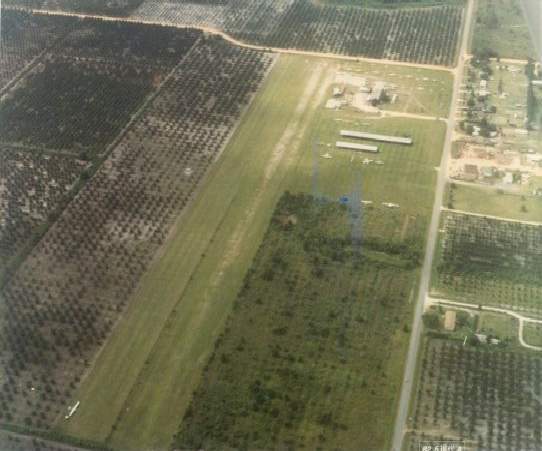 A 1969 aerial view of the site of Airlando Airpark (courtesy of Daniel Lewis) showed the single east/west grass runway & building remained intact, though abandoned. 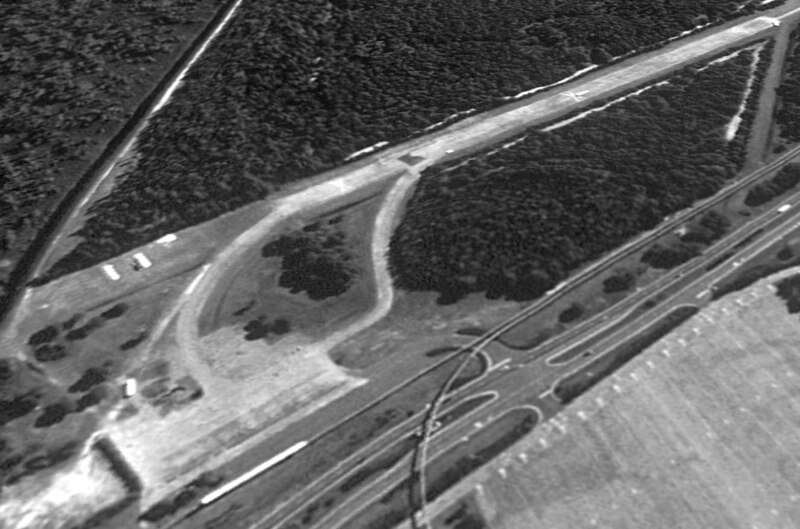 A 1980 aerial view showed Buena Vista Drive had been built through the site of the runway. 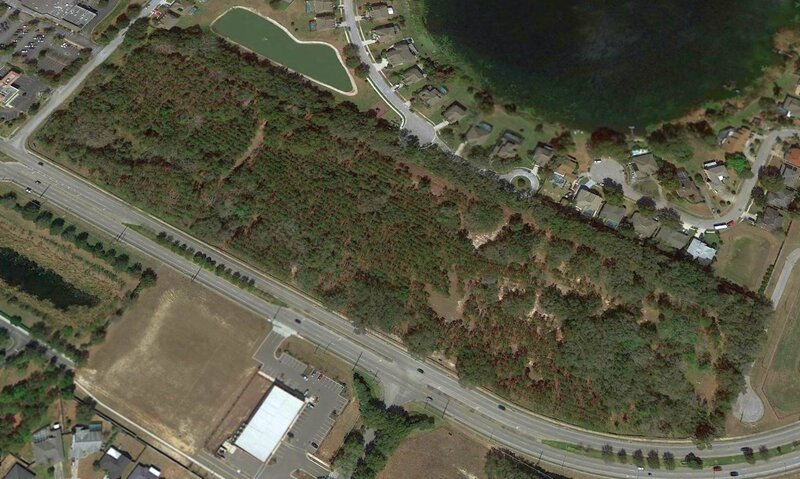 A 2013 aerial view (courtesy of Daniel Lewis) of the site of Airlando Airpark. Daniel Lewis observed, “What amazes me most is how they were able to rearrange water features at will, which you could never get away with nowadays. A 2015 photo by Daniel Lewis of the site of Air Lando Airpark. 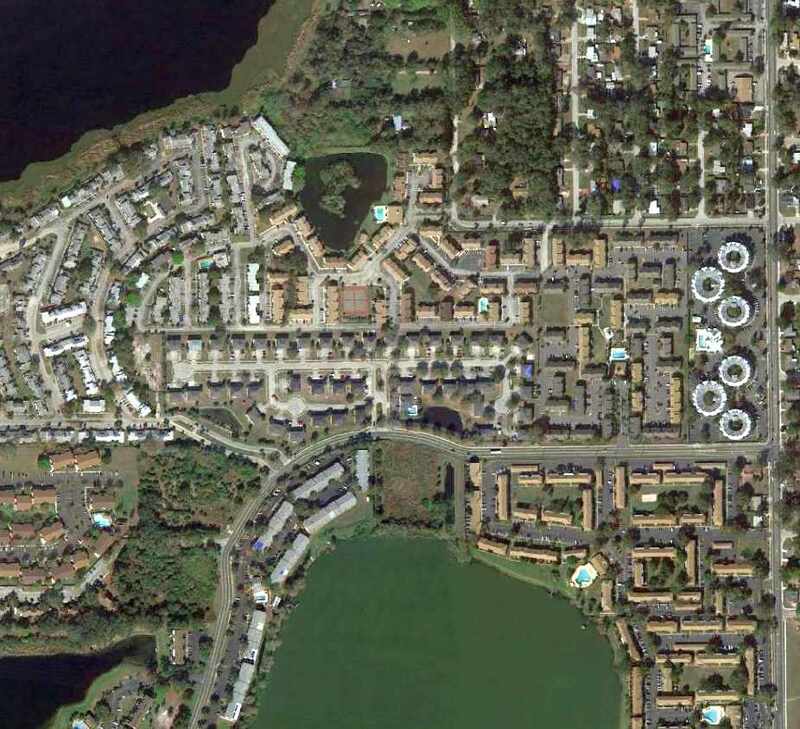 which is sandwiched between Disney property & the Grand Cypress Resort property. As I was walking by, the owner was leaving for a doctor’s appointment. The site of Air-Lando Airpark is located northwest of the intersection of Buena Vista Drive & Club Lake Drive. Thanks to Daniel Lewis for pointing out this airfield. 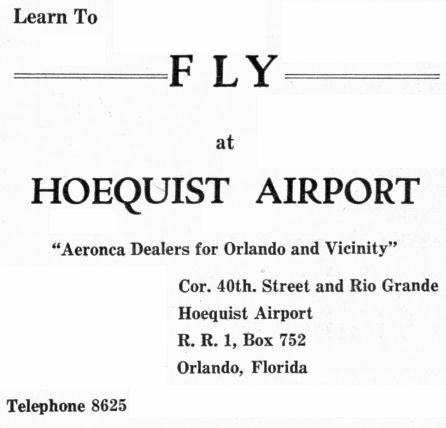 Hoequist Airport, as depicted on the 1942 Orlando Sectional Chart. It was founded by Elmer Hoequist. which depicted Hoequist as a commercial/municipal airport. It depicted Hoequist as having 2 unpaved runways. having 2 sand 2,000' runways, oriented north/south & east/west. The 1951 USGS topo map depicted Hoequist Landing Field as having 2 unpaved runways. 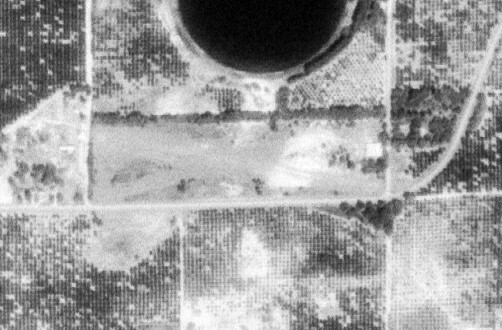 The last photo which hash been located showing Hoequist Airport was a 4/9/52 USGS aerial view. It depicted Hoequist as having 2 grass runways, with 3 hangars & 10 single-engine light planes on the northeast side. 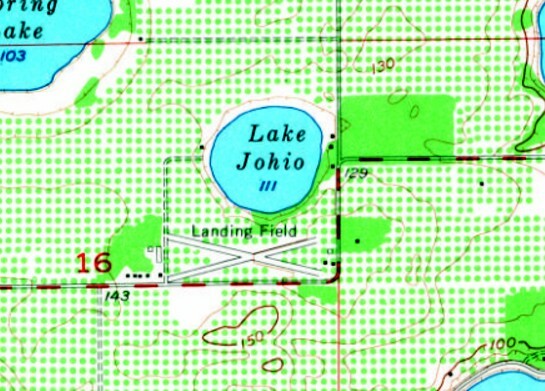 Hoequist Landing Field was depicted in an unchanged fashion on the 1960 USGS topo map. described Hoequist as having 2 turf runways, with the longest being 2,000'. 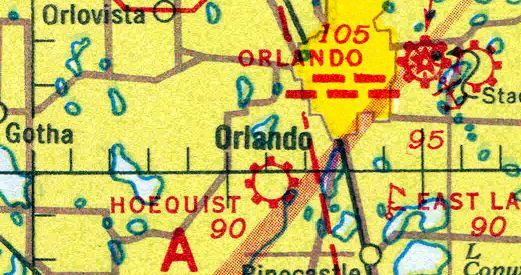 The last aeronautical chart depiction which has been located of Hoequist Airport was on the 1967 Orlando Sectional Chart. It depicted Hoequist as having a 2,000' unpaved runway. Dgil987 recalled, “Hoequist Airport... My dad had a C-140 there for a few years. with 3 small buildings on the northeast side. Hoequist Airport was no longer depicted on the October 1968 Jacksonville Sectional Chart (courtesy of Ron Plante). 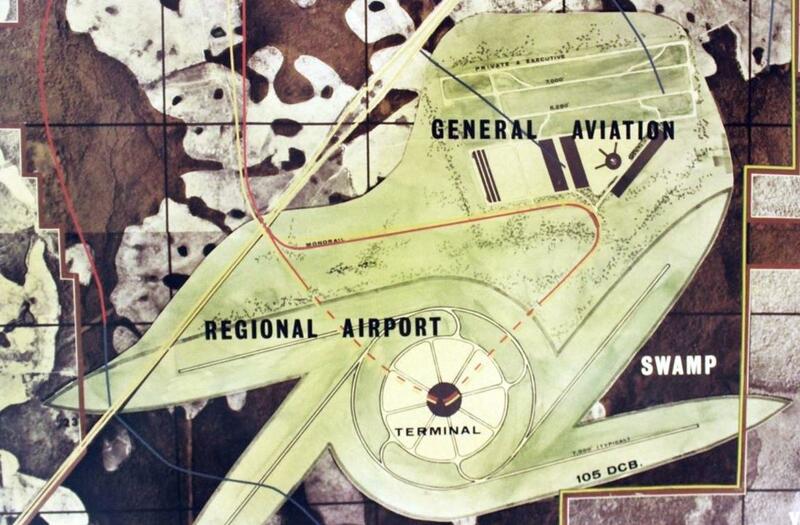 The last depiction which has been located of Hoequist Airport was on a 1969 FL DOT map (courtesy of Jim Burnett). The 1970 USGS topo map no longer depicted Hoequist Airport. 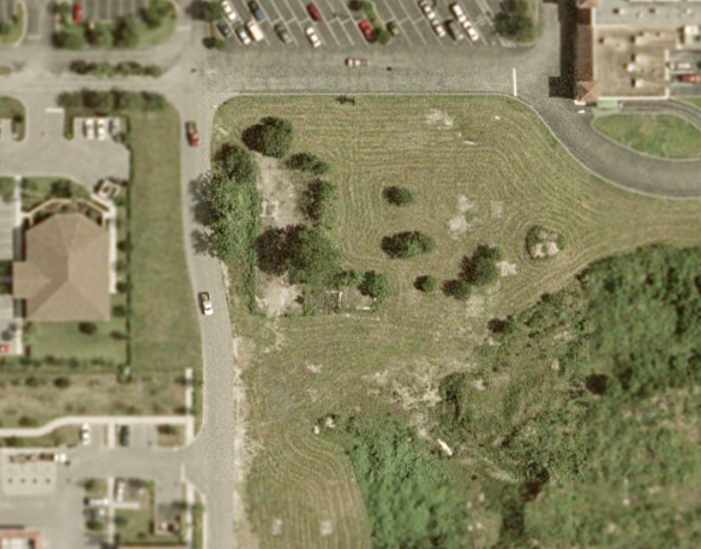 A 1/22/13 aerial view showed the site of Hoequist Airport. The site of Hoequist Airport is located west of the intersection of South Rio Grande Avenue & 40th Street. 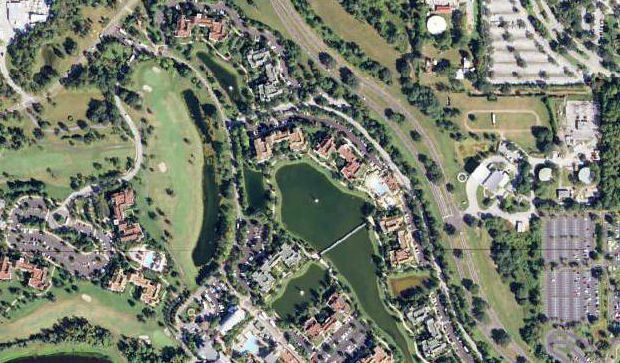 The circular landing pad of the Epcot Center Ultralight Flightpark was still visible in a 2/5/95 USGS aerial photo. 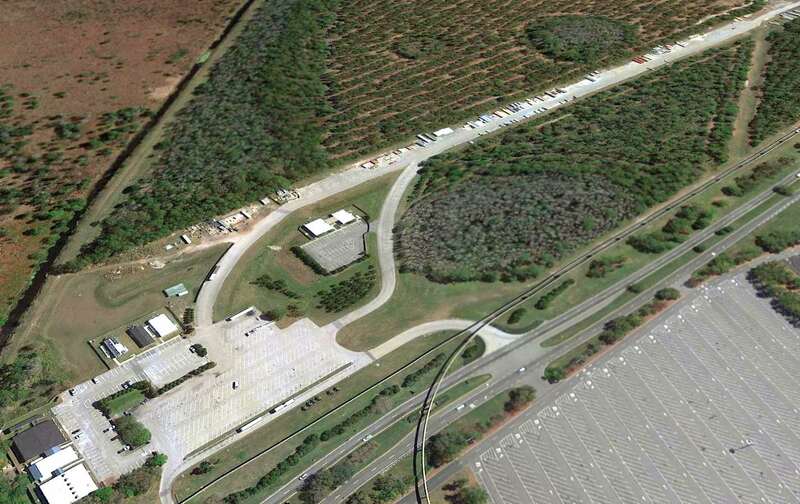 a second smaller airfield was evidently operated for several years along the southern edge of the Disney property. The Epcot Center Ultralight Flightpark was not yet depicted at all on a 1980 aerial view. and was used to launch aircraft used in the 'Skylaidescope' & 'Surprise in the Skies' shows at the Epcot theme park. and used a conventional grass runway visible to the [east] across the water from the circular runway. 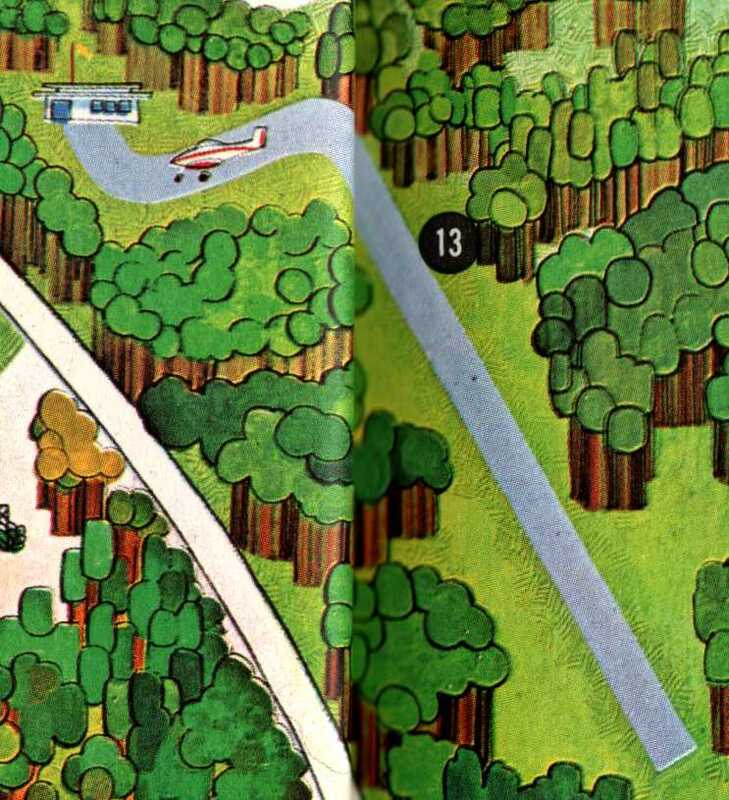 The Epcot Center Ultralight Flightpark was not yet depicted on the 1991 USGS topo map. John Sarra recalled, “I worked on the show in 1991 on the circular runway. The circular runway was created in 1991 for 'Surprise in the Skies' and was only used for Powered Parachutes called ParaPlanes. There were 10 paraplanes based there, no buildings just large trailers. After each day the paraplanes were loaded in the trailers & driven to a warehouse 1 mile away. There was a boat ramp off the round runway, still visible, used for the rescue boat which was launched prior to all takeoffs & landings. I was the ParaPlane dealer in Orlando. We sold Disney the 10 Paraplanes. We trained all the pilots. John continued, “'Surprise in the Skies' only ran for only one year. The show was planned from the beginning to be just a 1-year show for the 10th anniversary of Epcot. The earliest depiction of the Epcot Center Ultralight Flightpark which has been located was on a 2/5/95 USGS aerial photo. It depicted the field as consisting of a 400' diameter circular grass field. 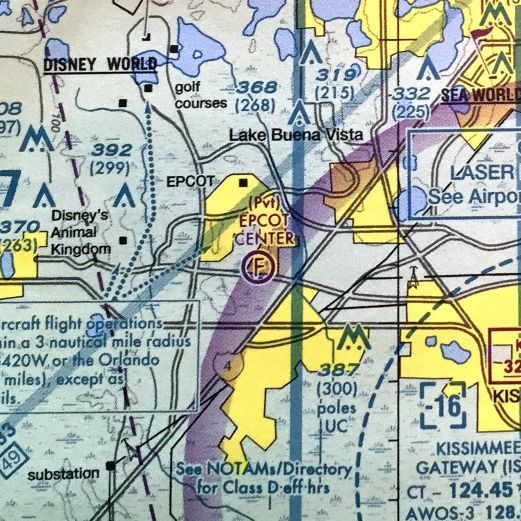 The Epcot airfield was still not depicted on the September 1996 Orlando Sectional Aeronautical Chart (according to Chris Kennedy). 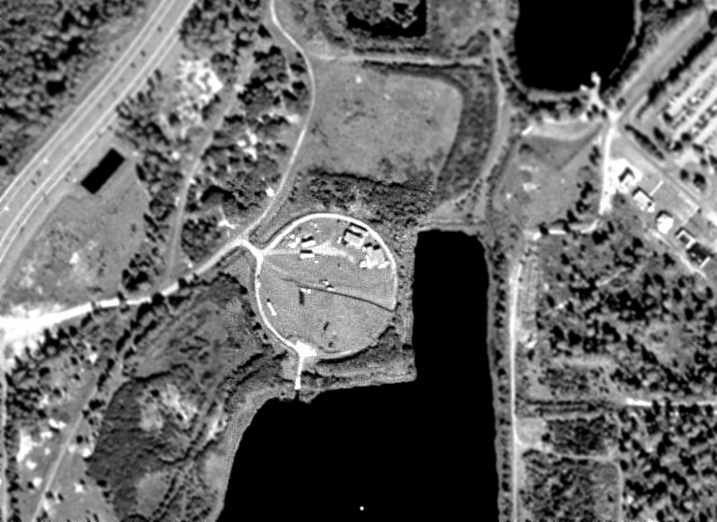 A 1999 USGS aerial view showed several small buildings or trailers on the circular landing pad of the Epcot Center Ultralight Flightpark. According to Wikipedia, “The land sat unused for nearly 10 years, when it was cleared for the 2nd phase of Disney's Pop Century Resort, named the Legendary Years. even though the airfield had been covered by a hotel for at least a year by that point. with no remaining trace of the former airfield. on the February 2004 Orlando Terminal Aeronautical Chart (according to Chris Kennedy). now covered by the abandoned hotel buildings of the never-completed Disney Pop Century Legendary Years Resort. There is no remaining trace of the former airfield. even though the site of the airfield had been covered by buildings for at least 6 years by that point. 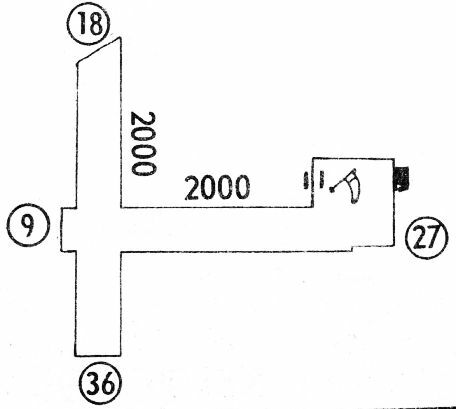 which matches the airfield configuration seen in the 1999 aerial photo. with the manager listed as Jay Parker. including 10 single-engine aircraft, and 10 ultralights. even though the airfield had been covered by a hotel for at least 8 years by that point. 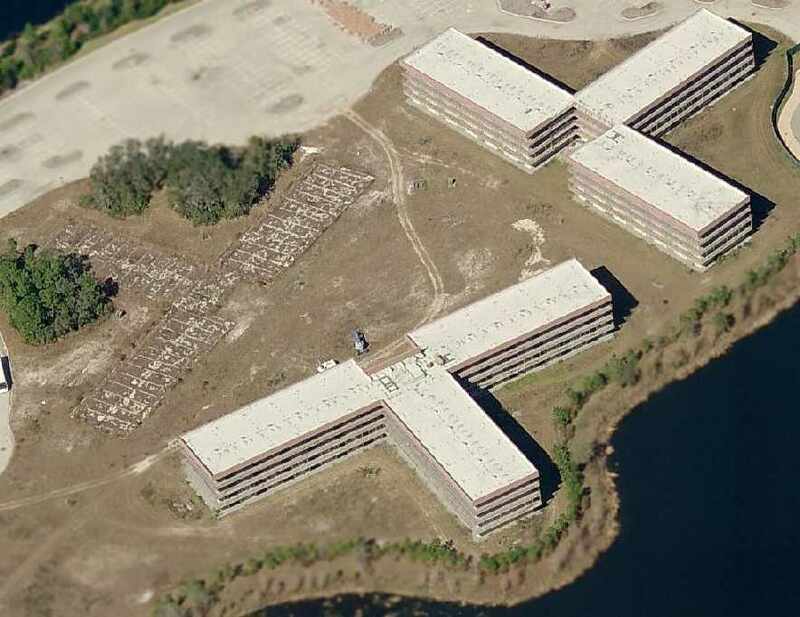 A 5/2/10 aerial view showed the hotel buildings on the site of the Epcot Center Ultralight Flightpark remained uncompleted. Maguire Airport, as depicted on the October 1968 Jacksonville Sectional Chart (courtesy of Ron Plante). Nancy Maguire (Harold Maguire's daughter) recalled, “The airport was never 'built' - it just evolved. Dad always had a plane & had to keep it either at Herndon or Longcoy's Airport. He decided to remove some trees in his orange grove (where the grove barn was built) and make a landing field just for himself. He built a hangar - more like an airplaneport instead of a carport. For many years when he came back from a trip, he would buzz the house so Mom would know to go pick him up. The whole town knew when he returned. he would line up with the lights from Highway 50 & the light from the hangar & judge the distance & land. He could even do this with a Baron. 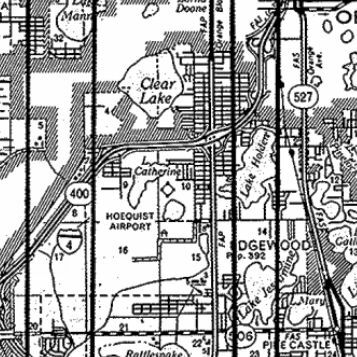 Maguire Airport was not yet depicted at all on the 1966 Orlando Sectional Chart (according to Chris Kennedy). asked Dad is they could keep their planes at his strip & before long it became Maguire Airport. 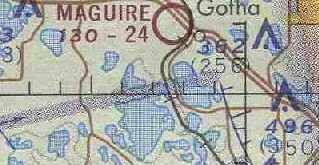 Maguire Airport was not yet depicted at all on the 1968 USGS topo map. The earliest depiction which has been located of Maguire Airport was on the October 1968 Jacksonville Sectional Chart (courtesy of Ron Plante). It depicted Maguire as having a 2,300' unpaved runway. with a few small buildings on the southwest side. The earliest official listing of the airport which has been located was in the 1971 Flight Guide (which listed it in the "Low Use" airports section). It described Maguire Airport as having a single 2,800' unpaved runway. Harold Maguire was the original owner & operator of the airport, according to Brian Smith. According to Sue Thompson, Selby Birch was the contractor “who used his tractor to clear & create the runway. He was also the first to land there. Debbi Huckabee was my ground school instructor. I was a broke college student who had always dreampt of flying. The March 1972 Jacksonville Sectional Chart (courtesy of Chris Kennedy) depicted Maguire as having a 2,400' unpaved runway. 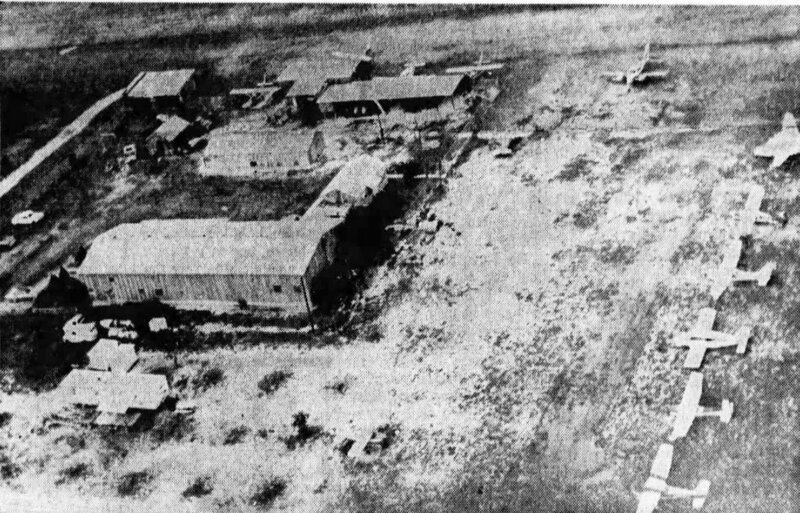 The earliest photo which has been located of Maguire Airport was an undated aerial view from a 5/7/72 article (courtesy of David Henderson). It depicted a dozen light single & twin-engine aircraft parked near a few small hangars. David Hendernson reported, “The obscure commuter VQ Airlines... I found a timetable that show that VQ Airlines' Disney World flights operated from Maguire Airport, not the Disney STOLport. Other articles show that for a short time, starting in May 1972, Shawnee Airlines operated shuttle flights between Maguire & Disney using Twin Otters! The January 1976 CH-25 World Aeronautical Chart (courtesy of Chris Kennedy) depicted Maguire an unchanged configuration. A 1979 photo by Brian Smith of a Maguire Airport lineman clowning around in the flight office at with a pair of view limiting goggles. A 1979 photo by Brian Smith of the wreck of Cessna 172 N734YH at the end of Maguire's Runway 18.
and was pictured here after being pulled back out of the trees onto the runway. The tail tore away from fuselage during this process. A 1979 photo (courtesy of Brian Smith) of the aftermath of a turkey buzzard strike on the left wing of Cessna 150 during cable patrol. Pilot Bob Coffey, continued the patrol with the deceased buzzard on his wing & returned safely to the airport. and the maintenance hangar is visible in the center background. Left to right: Dan Black, Dan Isaacs, Doug Denny, and Brian Smith. depicted over a dozen light aircraft on the southwest side of the field. Brian Smith recalled, "I was a flight instructor at the airport from 1978-80. At that time the airport was called 'Maguire Airport' and Mr. Harold McGuire ran the operation. The airport was located on Maguire Road between Windemere & Ocoee, FL. It was almost exactly 12nm west of the Orlando Executive Airport (then called Herndon Airport - ORL). and lived in the town of Ocoee, several miles north of the airport. Harold Maguire was a pilot during WW2. I think at one point as a instructor pilot. I also understood that he ferried B-17s across the Atlantic." Brian continued, "Many of the airport buildings were originally part of a farm implement company owned by the Maguires. they manufactured some sort of farm implement used in the orange groves. If I remember correctly, the manufacturing rights were eventually sold to the Ford Company. Perhaps this is when Harold decided to turn the place into an airport." I assume in memory of Harold's son." "During my tenure the airport was indeed a busy place. and also flew a pipeline patrol every week from Florida all the way out to Texas. Mickey's Air Service sold av-gas & the tie-down lines were always nearly full. Sue Hauchabee held ground school regularly. Mark Calderazzo & Paul Weston were linemen, and our mechanic's last name was "Dietz". And of course, there was Harold McGuire." Brian continued, "My first day on the job was a disaster. and introduced me to who I thought was another instructor pilot. That's when I found out this guy was actually my first student. Mind you, I had never flown a C-152, nor had I ever flown into, or out, of this short grass airport before. We lined up on this 2,300' grass runway with orange trees at the end & firewalled the thing. It began to look like we weren't going to get airborne so I made an executive decision & aborted. and almost stopped when the nose wheel dipped into the ditch at the end of Runway 18. The tail of the plane was now sticking up on about a 30 degree angle. Fortunately we were only moving at a few MPH by this time & not much else happened. Talk about an embarrassing start to a new job! and was the only flight instructor for the majority of the time." Brian continued, "After I left in 1980, the airport was run for a time by Joe & Peg Austin. Joe & Peg were flight students of mine. I know they eventually moved to Camellia, GA & ran an FBO at that airport." "That job was perhaps the most enjoyable of all my flying career with the exception of the pay (a great week was $90). buzzing a ground school class in a Bonanza & other stuff we shouldn't have been doing. Most of which was done when Harold wasn't around." as having a single 2,340' turf Runway 18/36. Ronald Walden recalled, “Maguire Airport: From 1979-82, my father, Alfred Walden was co-owner of Orange Aviation & he ran the day-to-day operations of the airport. Dave Pearlman & 2 investors purchased the physical property & leased it back to Orange Aviation. I learned to fly there trading my time working as a flight boy (with Doug Hammock) for lessons with Ted Huckabee. My first flight was in a Piper J-3 Cub (black with orange stripes) that belonged to Dave Pearlman & was piloted by Ed Isaacs. My first some time later was in my father’s 1945 Piper J-3; it was yellow with black stripes. The shop was run by Emmett 'Mad Dog' Watson who is shown in the buzzard picture with his shirt off. so I could fly an airplane, I just needed someone to drive me to the airport. or head over to Cedar Key with Hugh Grimes (mayor of Winter Garden) in his C-210. It wasn’t until later in life that I realized these were special, almost surreal times. The antics of the bush pilots were a treat. For instance, Kerry Simms coming in on Runway 09 with his J-3…Runway 09 was the taxiway out of the T-hangars! shut it down & jumped out to push it right back into the parking spot in the T-hangar! An undated (circa 1980s?) photo of a beautifully restored Ryan PT-22 trainer at Maguire Airport. An undated (circa 1980s?) 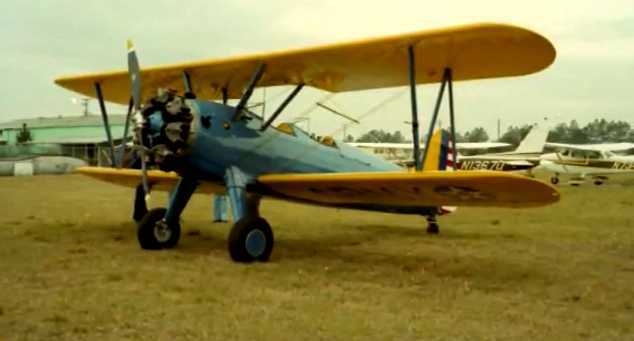 photo of a beautifully restored Stearman trainer at Maguire Airport. A circa 1980s aerial view looking south at Orlando West Airport by Stephen Mahaley. A circa 1980s aerial view looking west at Orlando West Airport by Stephen Mahaley. Several hangars & other buildings sat at the southwest corner of the airfield, along Maguire Road. The airport was apparently well-used, as over 20 light aircraft can be seen in the photos. According to Stephen Mahaley, by the 1980s it was known as Orlando West Airport. He recalls, "The parallel north/south turf runways were about 2,600'. A glider operation used the outside runway, other aircraft used the inner runway." along with a few small buildings on the southwest side. which depicted it as having a 2,400' unpaved runway. Mike Skinner recalled, “In 1988 I was west of Orlando & saw a Ford Trimotor flying. I looked up & saw that thing & HAD to find out what it was all about. A little detective work brought me to Maguire Field where the Trimotor was offering rides. Unfortunately,due to my work schedule, I couldn't hang around to take advantage of this opportunity. 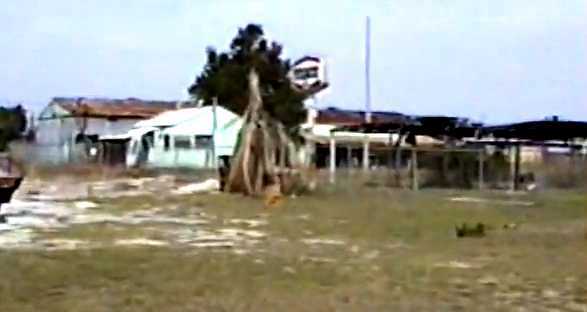 A 3/25/90 photo of the abandoned Maguire Airport office & hangars. 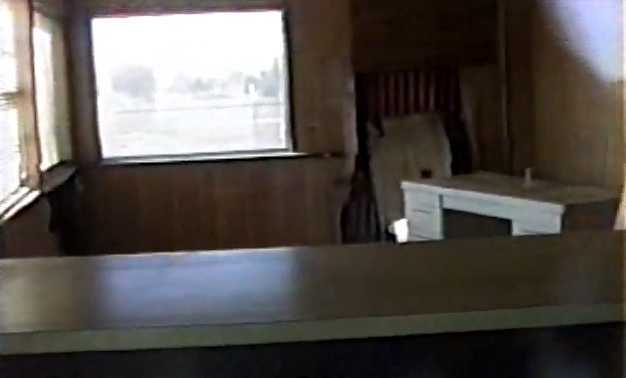 A 3/25/90 photo of the interior of the abandoned Maguire Airport office. and Orlando West Airport was still there but closed & abandoned. A Publix Supermarket was built there maybe around 1993 along with other strip mall stores." The 1999 USGS aerial photo showed that the property had been redeveloped with housing & a shopping center. 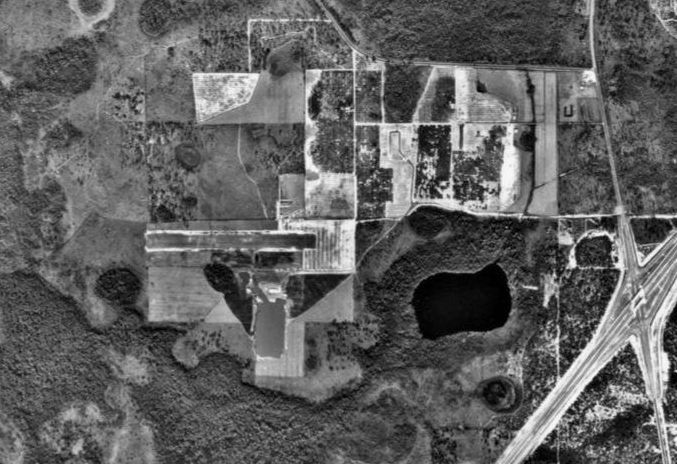 The 2002 USGS aerial photo showed that the site of Maguire Airport has been covered with housing & retail construction. as well as the smaller foundation to its right of the former flight office. "I periodically make it back to the area. The airport is now completely gone. In its place is a shopping center & residential homes. It is no longer the rural area & the groves are all gone. The area looks nothing like it did in the heyday of the airport. I wonder if any of the new homeowners know what went on there in the 1970s?" [Harold Maguire, founder of Maguire airport] and noticed an estate sale. After buying a memento I found that Harold had just recently died. He was quite a dreamer." of the former Maguire Airport maintenance hangar as well as the smaller foundation to its right of the former flight office is all gone. appears to be being prepared for an expansion to the parking lot. Orlando West Airport was located southeast of the intersection of Maguire Road & Bridge Creek Boulevard. The DisneyWorld Airport, as depicted on a 1971 DisneyWorld map (courtesy of Dallam Oliver-Lee). situated just adjacent to the east side of the main parking lot? A 1969 aerial view did not yet show any sign of an airfield at this location. Disney World's airfield was reportedly built in 1970 or 1971 during the construction of the Disney World resort. It was not yet depicted on the October 1971 Jacksonville Sectional Chart (according to Chris Kennedy). 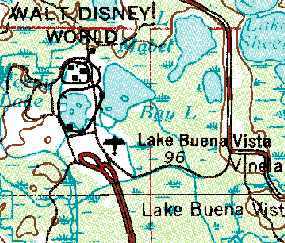 The earliest depiction of the Disney airfield which has been located was on a 1971 DisneyWorld map (courtesy of Dallam Oliver-Lee). It depicted a single northwest/southeast runway, with a taxiway leading to a small office on the northwest side. using 19 seat DeHavilland DHC-6 Twin Otters. The actual flight time was only a few minutes. Shawnee was the only airline ever to fly directly into the Magic Kingdom. According to David Henderson, “Shawnee Airlines & Executive Airlines both commenced service to Disney on 10/22/71 using Twin Otters. while Executive operated nonstops to Orlando Herndon & Tampa. A circa 1971 advertisement for Shawnee Airlines, describing their flights into Walt Disney World. A circa 1971 aerial view looking north at the Disney World STOLport (courtesy of Tim Buntin). Note the de Havilland DHC-6 Twin Otter headed right toward the camera, right above the Runway 34 numbers. (Shawnee Twin Otters had white below the windshield; Executive had dark blue). was on the March 1972 Jacksonville Sectional Chart (courtesy of Chris Kennedy). and described the field as having a 2,000' unpaved runway. there was no symbol depicting the actual location of the field. 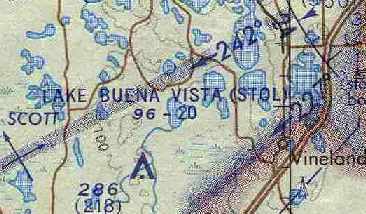 "Lake Buena Vista" Airport, as depicted on the 1972 USGS topo map. According to David Henderson, “Executive Airlines service at Disney was short-lived & the airline ceased all Florida operations on 12/9/71. VQ's service to Disney was noted in the 2/17/72 issue of Flight International but I've not found anything else after that date. By late summer of 1972, Shawnee had moved their Orlando operations from Herndon Airport to McCoy Jetport, allowing Disney flights to connect with major carriers. A Shawnee timetable from 9/1/72 shows 6 daily (except Saturday) round trips between Disney & McCoy with connecting service to other cities. Nonstop flights between Disney & other cities were discontinued earlier in the year. Mounting debt & low passenger loads forced Shawnee to shut down on the evening of 12/28/72, marking the end of commercial airline service at the STOLport. The Disney airport , which obviously seemed like a great idea at the time, was evidently regarded as a failed experiment by Disney & the commuter airlines. A 2/5/73 Florida Department of Transportation aerial photo (courtesy of Brian Rehwinkel) of the Disney World Airfield. or maybe this indicates that the airfield was not yet in use at this point). Note that the paved ramp at the northwest corner of the field had painted aircraft parking spots for a total of 4 aircraft. The Disney Airfield was kept at a very low profile. It was not listed at all in the 1976 AOPA Airports USA directory (according to Chris Kennedy). which placed an elevated monorail track just west of the runway. 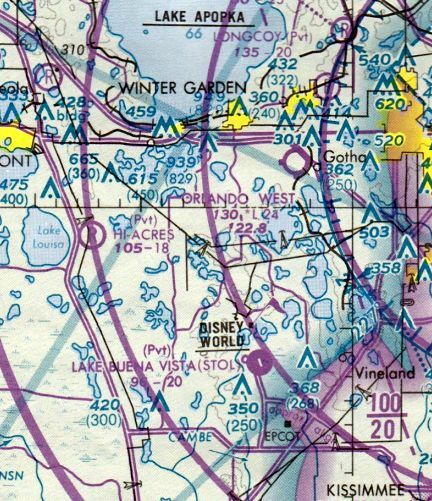 Therefore by the early 1980s Disney no longer allowed anyone to land at the Lake Buena Vista STOLport. this aircraft couldn't get clearance to land at WDW's private airfield. (which had been completely shut down to traffic just prior to the plane's arrival). Once the old Disney corporate plane was on the ground, it was then safely towed back to the studio theme park. 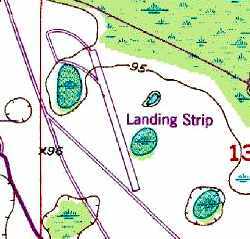 The 1985 USGS topo map depicted a 2,000' paved runway (labeled merely as "Landing Strip"). 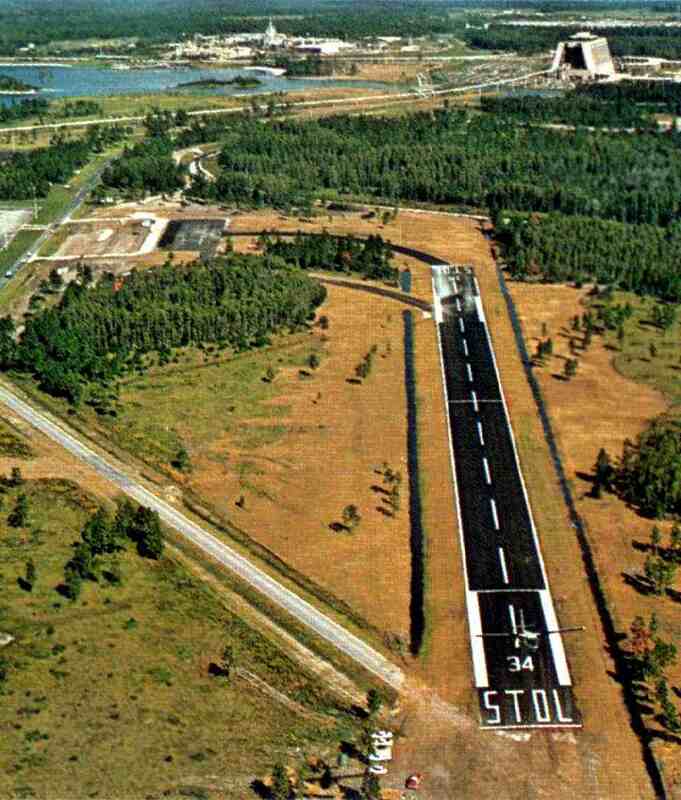 The 1985 Jacksonville Sectional Chart depicted the "Lake Buena Vista (STOL)" Airport as a private field having a 2,000' paved northwest/southeast runway. 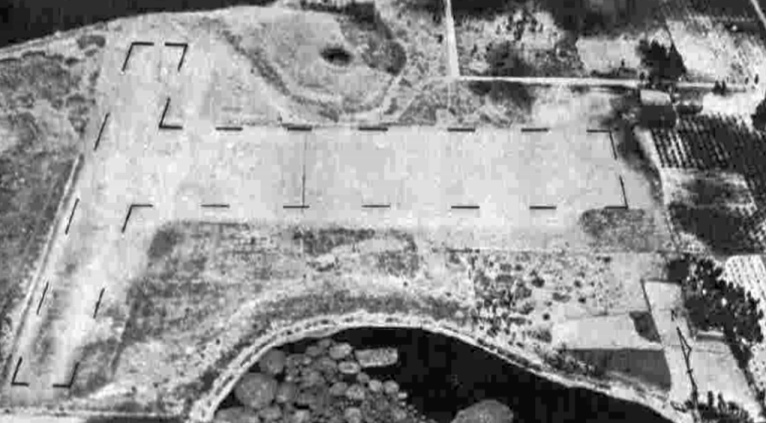 A 1995 USGS aerial view looking southeast depicted "X" closed-runway markings on the DisneyWorld runway. However, the airfield was still listed as an active private airfield, up until the late 1990s. 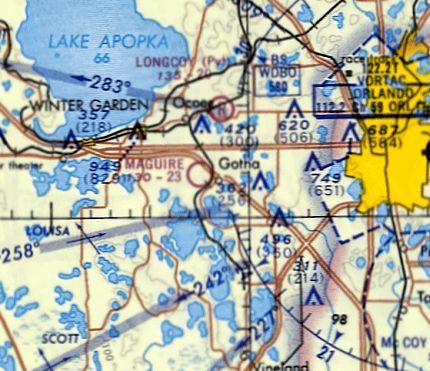 "Lake Buena Vista" Airport was still depicted as an active private airfield on the 1998 Jacksonville Sectional Chart. Paul Freeman visited the Disney Airfield in September 2004. The runway, taxiways, and ramp remained completely intact. The former runway was being used as a staging area for buses. 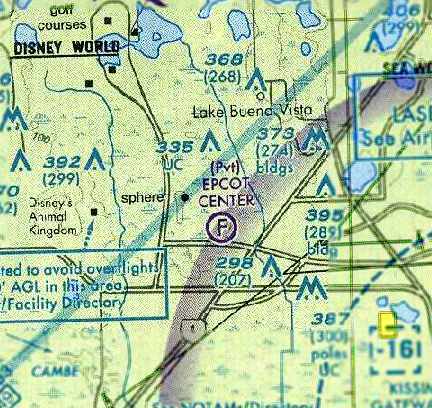 As of 2004, the Disney Airfield was no longer listed as an active airfield. However, LJ reported in 2006, “I work for the company & go by the airstrip on a regular basis. The airstrip is closed only to the public but is still in use. In the last 2 years they have been parking buses, sea creates, and tractor trailers on the runway. The monorail has never been a problem. Yesterday 2/16/06 the sea creates & truck trailers were moved off but still lined the runway. An aircraft landed & took off after making its drop. A truck trailer was then immediately towed on to the runway to block any other aircraft from landing. This turned out to be the preparation team for President Bush's visit today. A 10/28/13 aerial view by Ryan Lowrey looking southeast at the Lake Buena Vista STOLport. with the runway visible in the background. 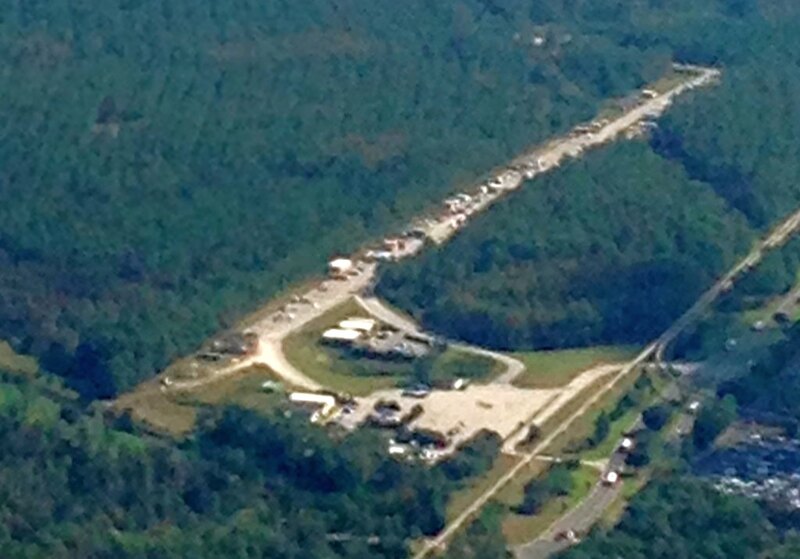 A 2016 aerial view looking southeast at the DisneyWorld runway. a “Temporary” Flight Restriction which has been in place permanently for years. How ironic for a resort that was originally built with its own airport.